I’ve been feeling guilty for being away for so long but honestly I needed a break. Joe and I took a road trip to Tennessee, first to Memphis where we stopped by all the tourist locations, then headed farther east, driving South to North through the Sequatchie Valley where we went in search of my family tree. We had fun researching through libraries and archives trying to dig up little tidbits of interesting history. And when we returned home I had a little present about to be delivered (actually it was kind of big). Joe let me pick out my dream stove, a gas stove with a few extra bells and whistles. I haven’t cooked on gas in ages but it’s what I wanted to get back to and believe me there’s been some challenges. So while I’ve been relearning how to cook I’ve taken a couple weeks off to practice. My first test was nine dozen cupcakes for an office party where Joe works. I was a bit nervous about temperatures and fretted over every little detail but in the end my new oven didn’t let me down. So now that things have settled down a bit I’m hoping to get my groove back and post a few recipes again. This week I found cherries on sale and they were so good! I decided on individual crumbles because Joe loves that crumbly topping. 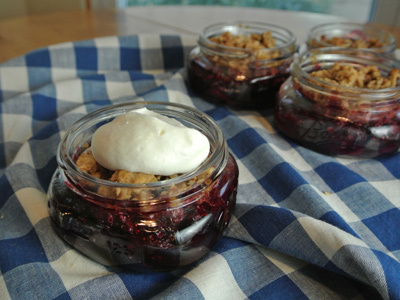 I cut down a pie filling recipe and altered the crumb topping so that it fit perfectly in my half pint jars. So cute and irresistible, plus they tasted great too! 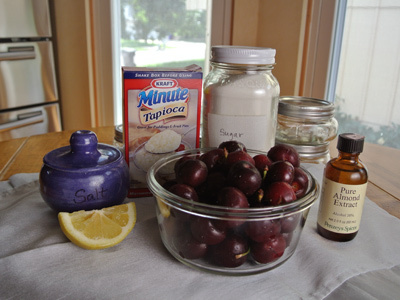 For 4 individual servings I used 2 cups of cherries, sugar, salt, tapioca, lemon juice and almond extract. 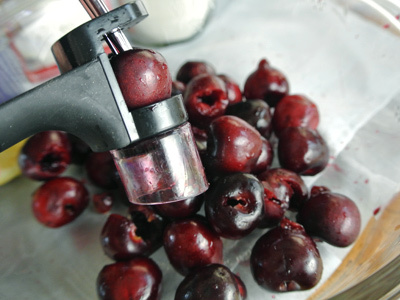 First I pitted the cherries which is much easier with my handy dandy cherry pitter! 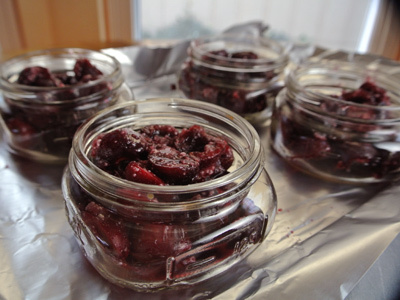 I didn’t think these cherries would cook down as easily as pie cherries so I halved them to help release their juices as they cooked. I began by adding tapioca. Plus almond extract and lemon juice . . . Now mix it all together. 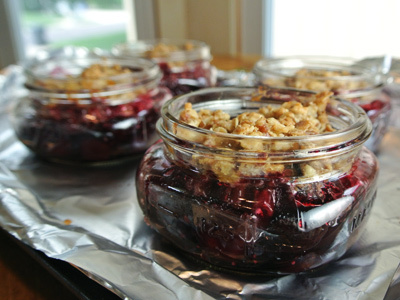 And pack it into 4 half pint jars. I know that it will take longer for these cherries to break down in the cooking process so I’m going to place them in a preheated 350 degree oven for 25 minutes. At that point I will add the crumbly topping and place back in the oven for the remaining cook time. 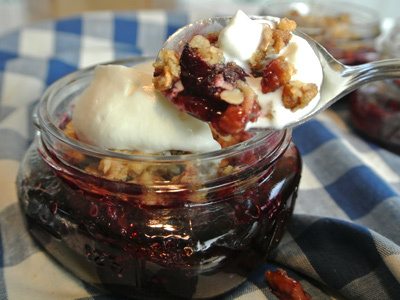 While you can certainly make the crumbly topping ahead of time, there is plenty of time to make it while the cherries are in the oven. I combined some brown sugar, butter, multi grain oat mix, flour, cinnamon, salt and pecans. First I blended the sugar and butter together. 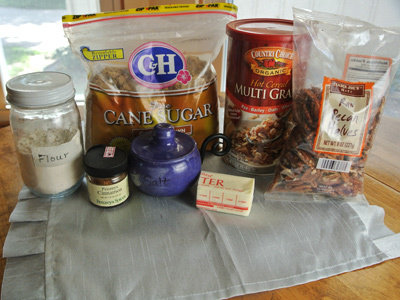 The added the remaining ingredients. In no particular order use a pastry cutter to combine the remaining ingredients until it resembles a coarse crumbly topping. 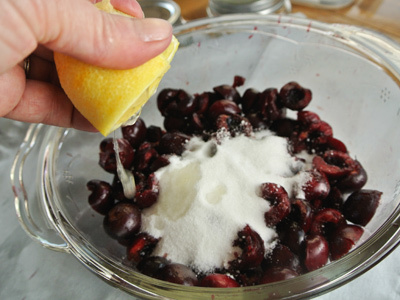 The cherries have now cooked 25 minutes but still haven’t broken down the juices yet. 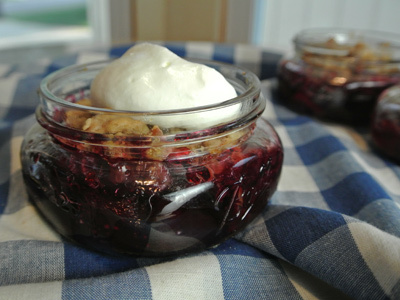 Divide the crumbly topping between the 4 jars, gently placing just over the rim of each jar. Back in the oven they go for another 20 – 25 minutes. 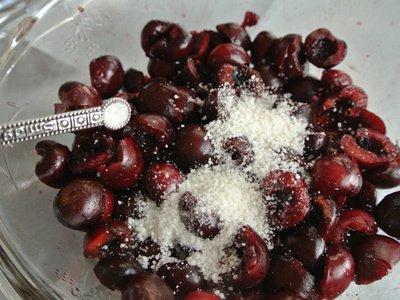 These went 20 minutes before the topping was browned to perfection and the cherries were bubbling with juicy sweetness. You can see the topping has shrunk below the jar rim. These can be sealed with the lids and saved for later. I wish I had ice cream but a little whipped cream will do! Preheat oven to 350 degrees. 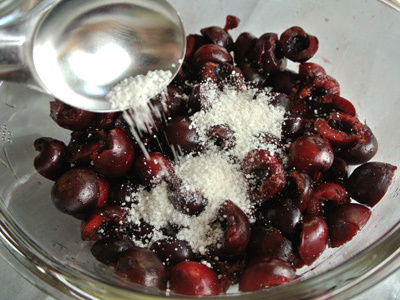 In a medium bowl, combine the pitted cherries, tapioca, salt, sugar, lemon juice and almond extract. 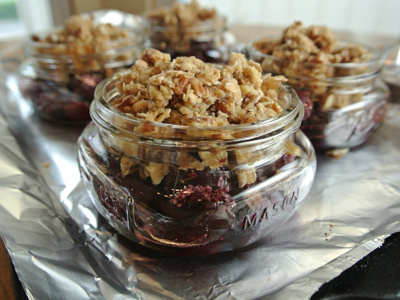 Stir together and spoon evenly into 4 half pint jars. Place in oven and bake for 25 minutes. 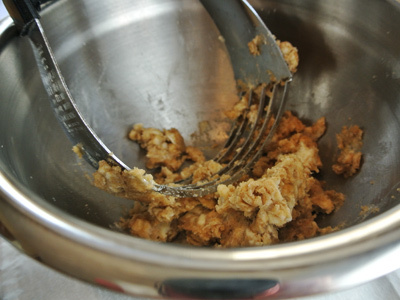 Using a pastry blender, blend together the butter and brown sugar. 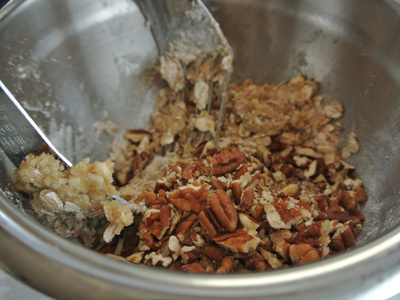 Begin adding the oats, flour, salt, cinnamon and pecans. 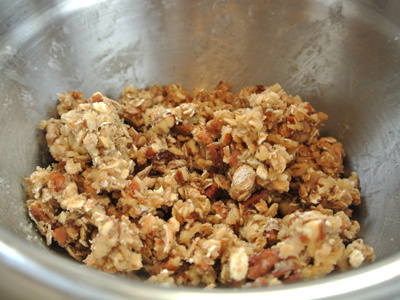 Blend together until it resembles a coarse crumbly mixture. 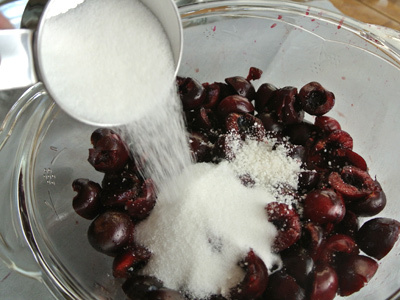 Remove the jars of cherry mix from the oven and evenly divide the crumb mixture over the cherries. 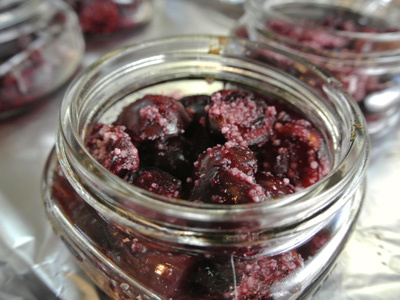 Place the jars back in the oven and bake for an additional 20 – 25 minutes or until the topping has browned and cherries are fully cooked and bubbling.